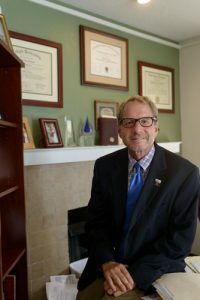 Overlooking the UF Health Florida Recovery Center from his restored alcove of an office, Scott Teitelbaum, M.D., FASM, reflects on the journey that has led him to the University of Florida, where he has been a respected member of the health care community for nearly 20 years. Professionally, Teitelbaum is at the top of his field, training more addiction fellows than anyone in the United States. He has received the prestigious Annual Award from the American Society of Addiction Medicine, which honors outstanding contributions to the science of addiction medicine. “Scott has established an exemplary addiction treatment program at UF that is nationally recognized as outstanding,” said Robert L. DuPont, M.D., the first director of the National Institute on Drug Abuse from 1973-1978 and the second White House Drug Czar from 1973-1977. DuPont, who teaches clinical psychiatry at the Georgetown University School of Medicine, has known and mentored Teitelbaum for a decade. Teitelbaum has become such a strong advocate for addiction treatment because, as a recovering addict, he understands the forces that can lead a person to the depths of drug abuse. But his personal story, which he freely shares with others needing encouragement, is a testament to how a person can regain their footing in life. “Scott shows (his patients) the beauty of recovery from his own experiences,” said Kim Teitelbaum, ARNP, a nurse practitioner for UF Health Adult Psychiatry – Springhill and Teiltelbaum’s wife. They met 11 years ago when they both worked at the UF Health Shands Psychiatric Hospital, he as an attending physician on the detox unit. They married in 2008. A Staten Island native, Teitelbaum hails from humble beginnings. His father owned a furniture store and his mother was a schoolteacher. While a student at Lehigh University in Pennsylvania, Teitelbaum and his friend Harvey Cohen took a two-year spiritual journey — hitchhiking across the country together. They had to do manual labor to make ends meet, and Teitelbaum said it gave him a greater appreciation for the sacrifices his parents made to give him a college education. He returned to school a more focused student. “I went from having a 3.5 GPA to being a straight-A student,” he said. It was also during this period that his interest in drug use began to bloom. Teitelbaum attended medical school at the University of Rochester and completed his residency in pediatrics at the University of Connecticut. Over time, he developed a successful pediatric practice in Connecticut and loved his work. Despite his professional success, the lure of drugs grew. In time, the drugs won out, culminating in the end of his first marriage and of his practice. Looking to regain control of his life, he went to Hattiesburg, Mississippi, where he began working with John McRae Jr., M.D., who had traveled a similar road. McRae had been a successful surgeon before alcoholism derailed his career. He rebuilt his life and eventually became a board-certified addictionologist. Teitelbaum said McRae was instrumental in helping him turn his life around. “He believed in me when I couldn’t believe in myself,” Teitelbaum said. In Teitelbaum’s cozy office, many photos and mementos peek out around the room, but one item stands out among them. Sitting proudly atop the fireplace is McRae’s copy of “The Big Book,” the text that serves as a bible to members of Alcoholics Anonymous. The book was given to Teitelbaum after McRae’s death last year, along with a personal letter. After his recovery in Mississippi, Teitelbaum was offered an Addiction Medicine fellowship at UF in 1997 under Mark Gold, M.D., a renowned expert on the effects of tobacco, cocaine and other drugs on the brain. Teitelbaum also completed a fellowship in child psychiatry at UF before joining the faculty in 2002. 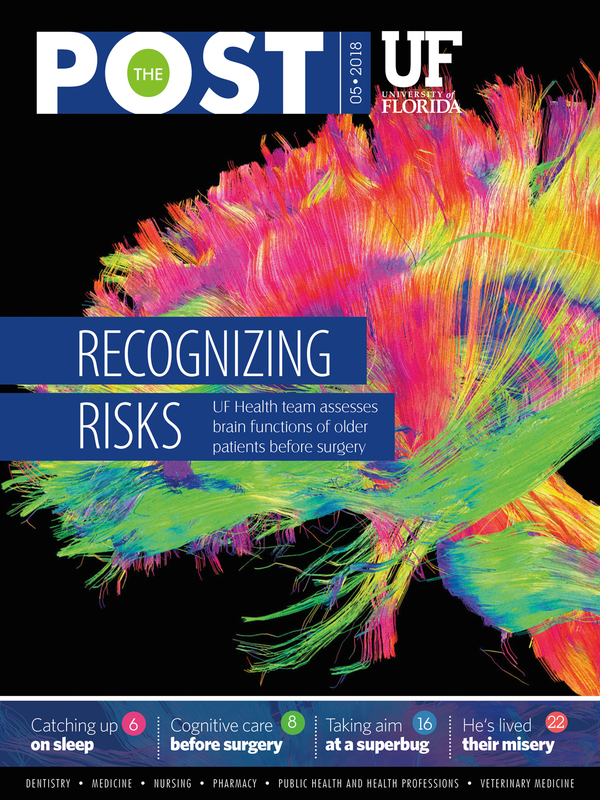 Teitelbaum is now the medical director of the UF Health Florida Recovery Center, the vice chair of the UF College of Medicine’s department of psychiatry, and the Pottash professor in psychiatry and neuroscience. He has five children, the oldest three from his first marriage and his two youngest with Kim. His oldest daughter, Sarah, was recently married, and his youngest son, Jacob, started Resilience Gives, which makes socks for hospitalized children, and he graduated from Wake Forest University. Teitelbaum’s middle son, Eric, has a master’s degree in social work from Fordham University. Teitelbaum expresses great pride in the ability of all of his children, now including daughters Dahlia and Eliana, to be resilient in the face of life’s adversities. Teitelbaum noted that his work treating people with substance use disorders is very different from the years he practiced pediatrics. The FRC was founded in 1999 as the state and university recognized the need for a high-quality treatment center in. At the time, many Florida health care professionals were being sent out of state to be treated for their addictions. The campus on Southwest 13th Street opened in 2012. Currently, patients are referred to the FRC from as far away as New England and the west coast of the United States. Teitelbaum is very proud of the support the university has shown plus its recognition of the importance of educating students and training other professionals about the disease. Teitelbaum knows all too well how addiction can affect families, citing the pain that was inflicted in his own family because of his addiction and the healing power of recovery within families. He credits placing his primary focus on his recovery, family support and good mentorship for helping him with his career transition. Taking cues from his own battle with addiction, Teitelbaum believes recovery is possible, keeping a quote from his mother in his thoughts.